What HIPAA compliant email providers do is turning an insecure communication method into something secure and potentially HIPAA compliant. Please be sure you have read this full in-depth article first: HIPAA Compliant Email Explained were you learn more about the potential risks and benefits of combining HIPAA and email. On this page you will find the complete list of HIPAA compliant email providers. There are more email providers of course, but not all of them are up capable of offering a HIPAA compliant email solution that stands the test by providing excellent HIPAA email encryption. The companies listed offer outsourced HIPAA compliant email without the need to host anything on your own infrastructure. This type of arrangement makes them a business partner for which they need to sign a Business Associate Agreement (BAA). All of the providers in this list meet the HIPAA requirements and are willing to sign a BAA so you can be assured of full HIPAA email compliance. Many hosting companies offer HIPAA compliant email as an addition to their HIPAA compliant hosting packages which you can find in our full list of HIPAA compliant hosting providers. But there are also a few specialised HIPAA compliant email providers who offer just that, email. I listed these below, along with a link to the relevant product information. VM Racks offers HIPAA compliant hosting through Microsoft's Azure platform. ​Their email solution includes unlimited secure email sending, mobile access from tablets and phones, a secure API, ​and more. They have a trademarked solution called True HIPAA Compliance™ which they use to guarantee their packages are 100% HIPAA compliant and they sign BAA’s for all customers. Pricing for HIPAA Compliant Email starts at only $8/mailbox​. Basic HIPAA compliant email: $8 per month, per mailbox, no account minimum required. Advanced HIPAA compliant email, with retention: $15 per month, per mailbox, no account minimum required. Hushmail is a fully hosted email service with enhanced security and seamless, integrated encryption. In many ways, Hushmail is just like your current email provider but provides the ability to send and receive encrypted emails and attachments to and from anyone, even people who don’t use Hushmail. Hushmail for Healthcare is available everywhere you work with fully featured webmail, an iPhone app, and support for desktop and smartphone email applications. Pricing starts at $9.99 $8.99 /mailbox per month for their all-inclusive solution, with no minimum number of mailboxes. Premium HIPAA compliant email, with retention and mobile sync: $9.99 $8.99 per month, per mailbox, no account minimum. Special Deal: Sign-up through HIPAA HQ to get a lifetime discount of 10% per month! A $9.99 one-time fee is applied for account setup if you want to use your own domain. NeoCertified is a leader in secure communications, specializing in a seamless, easy-to-use Secure Email Solution for individuals and businesses alike. They make the process as simple and convenient as possible, allowing all users to send and receive secure messages from mobile devices, tablets, computers, and any other internet-connected device. All secure emails are sent via their Cloud-based portal which utilizes AES 256-bit encryption and is compliant with all national and state-wide regulations & requirements. Their Secure Email Solution is also compatible with all versions of Microsoft Outlook, including Outlook 365, which will give you the ability to compose, send, and receive secure messages directly from your Microsoft Outlook application. They will sign a BAA (Business Associate Agreement) and help with compliance needs. 256-bit encryption for all messages in transit and at rest. CustomerConnect for inbound secure email. 24/7 Customer Support available for all users and all recipients. NeoCertified currently offers 7-day free trials for their Secure Email Solution. Pricing starts at $30 /mailbox per month for their all-inclusive solution, with no minimum number of mailboxes. Premium HIPAA compliant email: $99 per year, per mailbox, no account minimum. Atlantic.Net provides a secure and fully audited hosting for HITECH and HIPAA Compliance, with plans starting at $328.00 per month. Atlantic offers HIPAA compliant email as part of their HIPAA compliant hosting solution. Please contact Atlantic for more information. LuxSci has recently revised its HIPAA email product which is now perfect for most businesses. They offer a full featured HIPAA compliant email solution at competitive prices. Their HIPAA related feature set is impressive. They make sure your email usage is fully HIPAA compliant and are willing to sign a BAA. 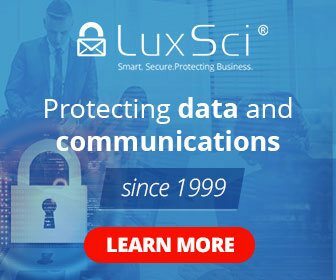 The LuxSci HIPAA email solution is actively safeguarded for the latest HIPAA Security and Privacy Rules, but has enough flexibility to combine both HIPAA accounts and non-HIPAA accounts. You can also choose LuxSci for additional HIPAA compliant services like web form processing. There is a 30-day free trial to test their HIPAA compliant email and their other services. Pricing starts at $20 /mailbox per month for their best protected solution, with a 5 ​mailbox ​minimum. Premium HIPAA compliant email, with retention and mobile sync: $10 per month, per mailbox, no account minimum. Advanced HIPAA compliant email, with retention: $8 per month, per mailbox, 2-user account minimum required. Basic HIPAA compliant email: $4 per month, per mailbox, 3-user account minimum required. A $100 one-time fee is applied for account setup. Microsoft was the first of the major secure email providers to offer full HIPAA compliant email. Their product Office 365 (using Outlook for email) meets all the necessary HIPAA email requirements. For Office 365 HIPAA Microsoft will sign a Business Associate Agreement (BAA) so your email services are classified as Protected Health Information (PHI). You can use the full suite of excellent Office 365 applications, along with Outlook for HIPAA email purposes. Microsoft Office 365 is priced very competitive priced given its features, making it an excellent choice for HIPAA compliant email. Pricing starts at $6 /mailbox per month for basis email (without the Office apps), with no minimum number of mailboxes. Office 365 Business Essentials (no apps): $6 per month, per mailbox, no account minimum. Office 365 Business Premium (including Office apps): $15 per month, per mailbox, no account minimum. Please know that the Office Business 365 Business plan doesn't include Business email, and is therefore not listed on this page. Microsoft offers a discount when paying annually. Google was very late with making it possible to use Gmail for HIPAA compliant email. But since 2013, they agreed to sign a BAA upon request. Since one of the most sought after questions for HIPAA email is “Is Gmail HIPAA compliant?” this move will certainly meet a certain demand. Please note: Gmail HIPAA compliance is only possible for the G Suite version of Gmail, which is the paid version. The free @gmail.com isn't covered by their BAA, and is therefore not allowed for transferring PHI. In fact it’s not only Gmail that can become HIPAA compliant, so do other apps within the G Suite. The full set for Google Apps HIPAA consists of: Gmail, Google Calendar, Google Drive, and the most popular Google Apps. Gmail HIPAA does come with a number of limitations, of which you can read more about in these guidelines. Compared to Office 365, Gmail isn’t quite there yet but they’re a viable alternative if you prefer Gmail for email handling. However, we advise to use a more convenient solution, from a dedicated HIPAA compliant email provider, which you'll find on this list. Pricing starts at $5 /mailbox per month for basic email (without the Office apps), with no minimum number of mailboxes. Premium HIPAA compliant email, with archiving and data loss prevention: $15 per month, per mailbox, no account minimum. Advanced HIPAA compliant email, with archiving: $10 per month, per mailbox, no account minimum. Basic HIPAA compliant email: $5 per month, per mailbox, no account minimum. Aspida Mail is a comprehensive mail system that specializes in HIPAA complaint email. With Aspida Mail you can rest assured that you are not only are sending ePHI securely, but you are also storing it securely as well. Included in all of their plans is 6 years of backup and retention on all emails that you send and receive, this is vital in case of an audit. Setup is simple, taking less than a day, with no software to install or maintain. Aspida Mail is competitively priced starting at just $10 /mailbox per month, with prices per mailbox dropping when you add more mailboxes. Special offer: Try the First Three months for $3! Aspida offers a 30 day money back guarantee, month to month contracts and risk free cancellation! Premium HIPAA compliant email, with retention, without domain name: ​$10 per month, per mailbox, no account minimum. Premium HIPAA compliant email, with retention, with your own domain name: ​$15 per month, per mailbox, no account minimum. Small practice HIPAA compliant email: $2,10 per month, per mailbox, for 1-4 accounts. Paubox provides a seamless encryption experience for users and works with most email platforms, including Office 365, Google Apps, Lotus Notes, and Microsoft Exchange. Instead of extra buttons to press, passwords to remember, or encryption keys to exchange, Paubox allows you to write and send emails as normal from your desktop, tablet or mobile device and encrypts all outbound and inbound messages for you in the background. 100% HIPAA compliant with BAA included on all paid accounts. Seamless encryption to prevent accidentally sending PHI over email. Opportunistic In-bound encryption, phishing protection, virus scanning, and spam filtering. Free 1 GB 256-bit AES encrypted file sharing account. Premium HIPAA compliant email: $30 per month, per mailbox, no account minimum. ​A $9,99 one-time fee is applied for account setup if you want to use your own domain. ​​MailHippo is a HIPAA Compliant email provider that lets you use your current email address to send and receive secure messages. Using a secure portal, users simply send and receive message in the encrypted portal and the recipient gets a notification that a new message is waiting for them. MailHippo offers managed services on their private servers and include 24/7 support and a signed BAA. There are no account minimums and they even offer a free trial. You can signup for a free beta account or choose to si​gnup for ​an account ​for $6.95 per month. ​HIPAA compliant email: $​6.95 per month, per mailbox, no account minimum.$6 per month, per mailbox, no account minimum. MDOfficeMail is a specialized email provider, offering only HIPAA compliant email and HIPAA compliant fax services (which works by email as well). MDOfficeMail comes with both desktop mail and webmail. They can be reach by phone or email, and even offer remote desktop support. MDOfficeMail has the lowest pricing of all HIPAA compliant email providers in this list, but they got an impressive array of technologies to allow for HIPAA encryption. MDOfficeMail will provide a BAA and will help you in setting up their service. Pricing starts at $2,10 /mailbox per month for basic email, with prices lowering when more accounts are ordered. Medium practice HIPAA compliant email: $1,60 per month, per mailbox, for 2-25 accounts. Large practice HIPAA compliant email: $1,25 per month, per mailbox, for 26-100 accounts. Email archival can be added for $0,90 per mailbox, per month. Prices get lower when paying annually. Entrust is another provider focusing only on HIPAA and email combined with related services like file sending. They offer a very convenient process to make your email HIPAA secure. There’s even an option to further increase the security of your messages by using email encryption with passwords. Entrust has a low-end pricing, but it still includes the ability to send secure files up to 2GB in size. Email Pros will sign a Business Associate Agreement (BAA) and help you reach full HIPAA email compliance. Pricing starts at $3 /mailbox per month for basic email, but all plans have a 5-user account minimum. Basic HIPAA compliant email: $3 per month, per mailbox, with a minimum of 5 accounts. Advanced HIPAA compliant email, with archiving: $4 per month, per mailbox, with a minimum of 5 accounts. Premium HIPAA compliant email, with archiving and Exchange: $5 per month, per mailbox, with a minimum of 5 accounts. MaxMD is a company providing a range of secure healthcare communication solutions with HIPAA and email being the main component. Called Direct mdEmail, it can be integrated in various ways into your existing email configuration. If you would like further integration into specific application you can use their so called Encryption as a Service (EaaS). Direct mdEmail by MaxMD is a custom solution so there’s no upfront pricing information available. Depending on your current or future needs MaxMD will work out a custom quote for you. Upon installation of their services they will provide a BAA. Direct mdEmail by MaxMD is a custom solution so there’s no upfront pricing information available. Depending on your current or future needs MaxMD will work out a custom quote for you.